Fiscalini Cheese is a farmstead cheesemaker in Modesto, California. They make award-winning cheeses using traditional methods and milk from their own herd of cows. They take great pride in the quality of their cheeses and the care of their cows, and they are deeply committed to sustainability, including recycling the waste from their farm to produce electricity. In 1886, the Mateo Fiscalini Family emigrated from Switzerland to the United States. In 1912, Mateo's son John Baptiste Fiscalini bought 160 acres in Modesto, and two years later, he started a dairy farm with 10 cows. They now have a state-of-the art dairy facility with 2,800 animals, and 1,500 of them are milked three times a day. All the farming land was converted into a rotation to be consumed by the animals. In 2000, after a trip to Switzerland where John Fiscalini learned the art of making cheese, they began using a portion of the milk to produce cheese. In 2001, Mariano Gonzalez came on board, and with John's facility and Mariano's experience perfectly complementing one another, together they produce some of the best cheeses in the world. Mariano Gonzalez is a world-renowned cheesemaker. Born in Paraguay, he moved to Vermont and began making cheese. He returned to Paraguay in hopes of starting his own cheesemaking operation, but the political environment was not safe for him and his family. 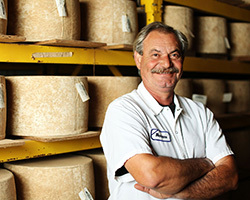 He returned to the states in 2000 and became the master cheesemaker for Fiscalini Cheese. 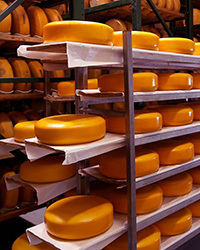 His cheeses have won some of the most prestigious national and international awards. 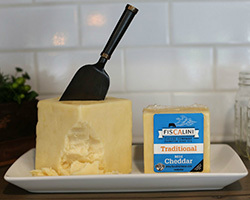 Extra Mature Bandage Wrapped Cheddar is Fiscalini's most popular and highly awarded cheese and is the reason for Mariano Gonzalez's fame within the industry. This cheese is made in traditional 60-pounds wheel (27 kg), bound in cheesecloth to protect the cheese during aging, and hand-turned daily for two months. Fiscalini Bandaged Wrapped Cheddar has been distinguished as the World's Best Cheddar at the World Cheese Awards in London three times, and remains the only American Cheddar to win the award. Aged 14 months, this cheese is firm, crumbly, and straw-colored and has a nutty, slightly smoky, earthy and more round finish than most aged Cheddars. 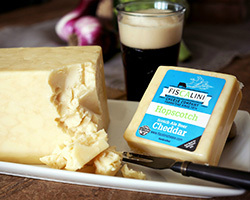 Fiscalini's Hopscotch Cheddar is truly one of kind, named after the "hops" present in the beer they use to create this unique cheese. To give this cheese its originality, they rinse the curds in an award-winning dark scotch ale beer made by Devil's Canyon Brewing Company located in San Carlos, California. They then mold the cheese into 40-pound blocks (18 kg) and then let it age, allowing for the unique flavor profile to emerge. This cheese has great cheddar flavor, slices well, and can be used for snacking, sandwiches, or cooking. 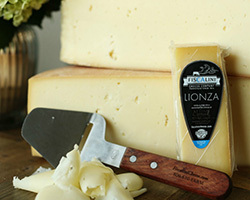 Lionza, a Swiss-style cheese, is named after the tiny village high in the Swiss Alps that the Fiscalinis called home for more than 300 years. They follow the same traditional steps today that were developed generations ago when their ancestors made cheese in Lionza. Made in 26-pound wheels (12 kg), similar to the traditional Swiss wheel, this cheese is aged for six months. Lionza is lightly straw-colored with a few irregular eyes. It has a thin natural rind, a sweet milk caramel-like flavor, an enchanting aroma, and a semi-soft texture. 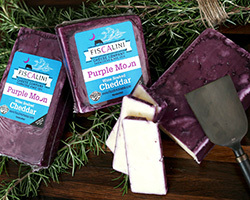 Fiscalini's Purple Moon is often described as the "perfect pair," that being none other than wine and cheese. Their traditional award-winning cheddar is soaked in a North Coast Cabernet Sauvignon that leaves the cheese with a distinct purple color on the outside and creamy finish on the inside. Purple Moon is unforgettable, delicious, and completely unique. It's the perfect addition to any cheese tray with a subtle and delightful flavor that will leave you coming back for more. This cheese is an American Original created by Fiscalini, and it is known as their award-winning mistake! In keeping with the European tradition of naming unique foods after the location where they were first produced, they named it San Joaquin Gold after the rich San Joaquin Valley of Central California. Made in 32-pound wheels (14.5 kg) and stamped with a cow's shape on the center as its trademark identification, this cheese is aged for 12 months. Mildly sweet and mellow when young, this cheese develops a darker golden hue and nuttier flavor over time. Its flesh is firm and granular with an aroma of toasted nuts and browned butter with a pleasant acidity and lovely sweetness. This extraordinary Fiscalini Cheddar is "white" in color, meaning no dye has been added, and it is still made the old-fashioned way with the use of a cheddar mill. Using all natural ingredients, this masterpiece is crafted with the knowledge and expertise of Fiscalini's cheesemaker in a truly artisan fashion. 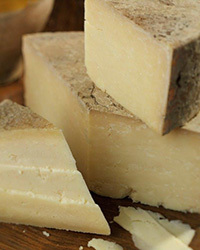 This cheese is molded into 40-pound blocks (18 kg), aged, and has a smooth mild cheddar flavor.